"Whenever people try to explain God's Word and apply it to our lives as Shelly Sorem has in her new devotional book, we have an opportunity to look into their lives and examine their own walk with God. As you read insights from a fellow traveler along the spiritual journey road, know that Shelly shares her heart and her Lord with you as we all journey together towards Christ-likeness. Those who take these insights and challenges and ingest them fully will find their lives looking more and more like Jesus every day. " --Dr. Tom Blackaby, author, International Director for Blackaby Ministries International When the Bible is an important part of your life, you want to gain a better understanding of it. Still, finding the time to do so may be difficult. Between family and work, it may seem studying the Bible is a daunting task--but it doesn't have to be. 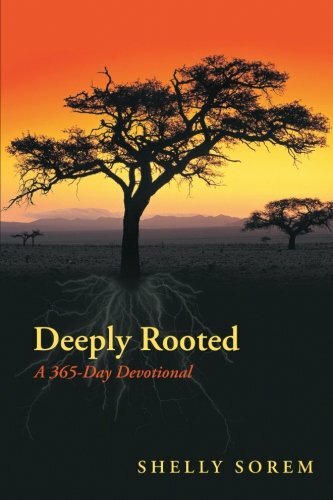 Deeply Rooted: A 365-Day Devotional presents a daily, yearlong devotional designed to jump-start your quiet time. Take a journey through the Bible from Genesis to Revelation, including Scriptures from every book in the Bible. Each day, author Shelly Sorem highlights a passage of Scripture and provides inspiring commentary to empower you to live the life God created you to live. Thought-provoking questions awaken your soul to an intimate relationship with your Creator. Deeply Rooted can help you discover comfort, encouragement, and hope for whatever you face in the pages of God's Word. Our lives are filled with things that clamor for our time and attention. This devotional provides a much-needed respite from the chaos of your busy life. Be uplifted, challenged, and find peace as you expand your knowledge of God's Word and learn how to practically apply biblical truths to your life. Shelly Sorem is a Bible teacher and international speaker. She has worked in children's and women's ministries, and she has served as a youth pastor. She has also spoken at women's conferences and retreats around the world. She holds a bachelor of science degree in education and a master's degree in counseling psychology. She currently lives in Texas.